My girlfriend, Maria, just signed us up for a beginner's yoga class. She paid the fee and I owe her the money. 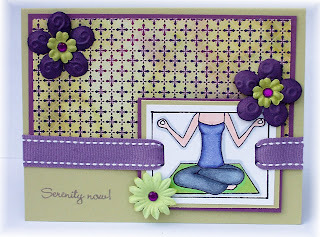 Well, I HAD to order this MFT set, Serenity Now, to make a card to send the check in! I have looked at this set a number of times and resisted buying it because I always thought "when would I use it?" Well today I needed it and here is the card. I combined this with today's Featured Stamper challenge, who is Niki Estes (NikiE). I browsed through her fabulous gallery and blog and looked for layouts that would accommodate my image. This is the card I chose to case. I wanted to showcase the new Basic Grey Eva dp and really liked the green and purple of this one. I used PTI's Spring Moss and Plum Pudding cardstock and the Plum Pudding stitched ribbon. I matched the copic markers as closely as I could to the papers. Her top looks blue in the picture, but it's really more purple like the ribbon. This is the inside and the rest is pretty self-explanatory. Thanks for stopping by! What a cute set of stamps this new SU Flight of the Butterfly is! There are several overlays for the butterfly and three "trails" of words to use. I used all SU products on this one today for the Sketch Challenge. This layout is so simple, yet it's a little "edgy" because the main panel is lined up against the right edge. I should have taken the picture more straight on rather than on an angle so you could see it better. This took only about 30 minutes for me to do (which is a record)! I think the most difficult thing was lining up the butterfly and words properly (with a SAMJ) so I had enough room to place the ribbon and the slide. The dp is Bella Rose and the red checked dp was stamped with the small butterfly in Riding Hood Red. I love stamping on dp. To me it's such an unexpected thing to do...why stamp on paper that already has a print on it? Because it's there, right? The polka dot paper is brown, but it looks black here. The main panel is on dimensionals because I love them (!) and the butterfly has stickles on it for sparkle because I love when cards sparkle! Well, that's it for today. Tomorrow is my first day back at school...no kids, just a district first day. Hopefully I'll be able to get into my room to unpack 25+ boxes and decorate my room before Wednesday! There was major construction done on our building and we had to COMPLETELY empty out our rooms. Now I have to put it all back plus get it ready for the kiddos! Wish me luck and thanks for stopping by! 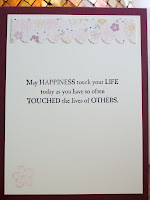 I needed a Christening card today and so I decided to use today's Featured Stamper challenge for my inspiration. Today's featured stamper is Kokirose. She has a great gallery...so many cards! I had several I wanted to use, however I settled on this one. The oval fit my christening dress image perfectly. When I went for my Nestabilities, I realized (for about the 100th time) that I don't have the ovals! I have everything but the ovals! So I couldn't scallop my largest oval. I had to use the coluzzle for cutting both ovals. What a difference the scallops make! It would have looked so much prettier. I used the textile cb folder on the pink pirouette and the brown oval. Kokirose's card had jewels on it, but I changed mine to pearls to give it a more vintage feel like the dress. The dp is Bella Rose, and I wished I would have used something that would have shown up better. It seems to be washed out against the pink pirouette. The ribbon is from SU's retired Theatre and the image is also from a retired SU set, Buggies and Booties. I added the flowers and sentiment. I also used the Spica clear glitter pen on the dress and a little on the pink flower. It's shimmery IRL. I don't have an appropriate sentiment for a christening to put inside, so I'll have to generate one on the computer and print it out. Thanks for looking and stop by again! This is one of the stamp sets I got at the StampScrapArtTour today (see my previous post below). It's by a company called Darcie's. It's really a cute set with several cling vinyl stamps already die cut. I fell in love with this "peaking zebra". I must say, however, that it took me A LONG TIME to do this zebra! I first tried copic markers (my favorite coloring medium lately), but I wasn't getting good results with blending and shading. I realized that my blender pen is dry! I need new refill it! So then I went to the prismacolor pencils and the blender pencil. That was a mess! All the shavings were going everywhere and it just didn't look good at all. That went into the trash. Then I used the prismacolor pencils again, but this time I used gamasol and a blending stump....much better results! This is really the first time I'm using gamasol and the blender stumps. It blends the colors so nicely! I do have to practice though. I had a difficult time blending the cheeks in properly. I guess it's ok for a first try. I accented the zebra with the clear Spica glitter pen. I used the distressed stripes cb folder on the black, but it wouldn't photograph well. The pink base of this card is 8 3/4" long and scored at 5 1/2". This is what the inside looks like. 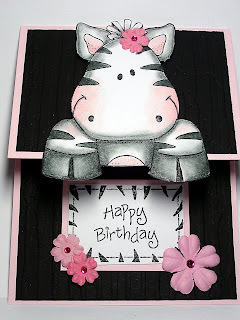 The zebra frame, happy birthday sentiment, and the three hearts are all single stamps in the set. The other sentiment is from SU's new Heard from the Heart. 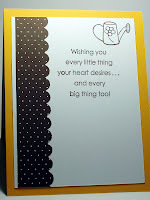 (I realized that I took this picture before I added the prima flowers to the card! Whoops!) I'm giving this card to a three-year old for her birthday tomorrow. Thanks for stopping by! That's how I felt today! 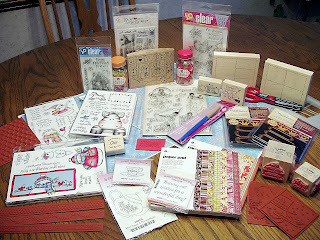 I went to the StampScrapArtTour in Hamburg, NY today (it also runs tomorrow) with my SCS friend, Cheryl Rowley. We met there when it opened at 10:00 and left at 4:00! When we went in, there didn't appear to be many vendors (only 20), but boy, were we pleasantly surprised! Almost every stand we visited had our heads spinning with creative stamps, designs, and techniques! I mentioned to Cheryl at one point that this must be what CHA is like on a much smaller scale...I can't even imagine being at CHA! Anyway, I came home, stretched my legs, rubbed my feet, ate, took a nap (LOL!) and then looked at my loot! I decided to share that with you here: Is this crazy or what? Cheryl and I kept on saying "we have good jobs" as a way of justifying our purchases! There were a lot of companies who were selling unmounted "naked" rubber stamps, so we were buying some of those to ease the pain in the wallet! At one booth we saw the new Basic Grey paper (Eva and Ambrosia) and Cheryl said that this booth sort of looked like our own LSS, Buffalo Stamps & Stuff, and sure enough it was! We told the owner that and she commented that she didn't think she had a "style", but she does! I think I spent the most $$$ there! We are so fortunate to have a great store like hers in our area. She is always on the cutting edge of the stamping industry and I love frequenting her store. In fact, she has lined up Karen Lockhart for two classes in October...I am already in the book for that one! Her husband was there promoting his "moose" stamps...the Hanna Riley moose stamps. He really likes those! I've taken the opportunity to list some of the vendors I purchased from today below. Buffalo Stamps & Stuff - A great store if you are ever in the area! Just For Fun - Cool stamps for creating "postage-like" designs. Art Gone Wild - This place had stamps on blocks that "rock"...they are curved on the rubber side. Really cool! Darcie's Country Folk - Great images mounted on cling vinyl, die-cut and in clear DVD containers (bought 3 sets!). Their paper was different...sized 12 x 18. They look like placemats (you can see them in my picture under the stamps)! Lost Coast Designs - Unmounted border stamps for $2! Well, that's it! I should get off and start putting this stuff away and start making something with them! I just wanted to also say "Hi" to my friends Kathy, Linda, and Liz that I saw there today. Anne and Judith, I looked for you but I think my eyes were focused on too many other things (LOL!). Thanks for stopping by and I hope you enjoyed my virtual tour today! I had been thinking about this color combinaton and this stamp all afternoon while I was out. I was wearing a shirt today with these colors and that was my inspiration...Pacific Point, black, and white. 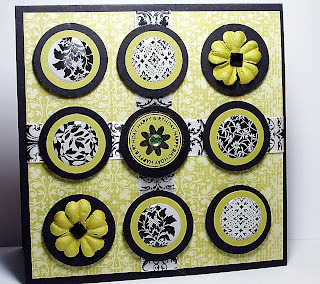 I also used this for another Featured Stamper challenge (see my Tilda card below this one for my first FS challenge today). As I was pulling this card together, I checked out Jessie's gallery again and chose this card to case. I had to change it a bit to fit my image. I don't know if you can see it, but the black band on the right is crimped...yes, crimped! (Click on the pic to get a better view of it.) Remember that tool that's gathering dust in the bottom of your drawer (at least that's where I found mine!)? Well, that's one of the things I liked about her card...the chance to use something I hadn't used in a while that gives the card texture. 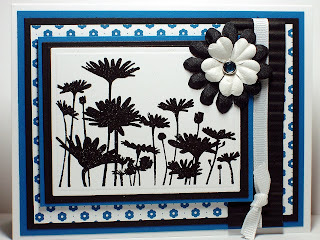 I started by embossing this stamp from SU's new Upsy Daisy in black ep. It was just screaming to be embossed in black! I paired it with the new Pacific Point dp and black and Pacific Point cardstock. The crystal brad in the center of the flowers is from SU's ice circles rhinestone brads and is a very good match for Pacific Point! Here's the inside of the card. I left it blank so I can use it for any occasion , however I did stamp one of the stamps from Pocket Silhouettes in the corner because it looked like it went with the image on the front. Thanks for stopping by and please take a look at my first Tilda in the previous post! My First Tilda and a Great Featured Stamper! I was so excited today when I saw the featured stamper...Jesse, aka knightrone! She has a fabulous gallery and I read her blog religiously! 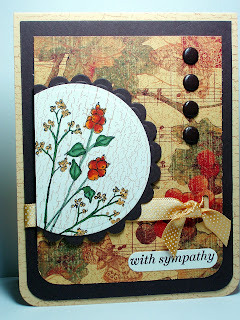 I love her style and she always has great layouts and always uses great embellishments! 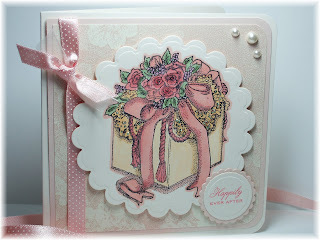 I chose this card to case today because I loved the layout, of course! I was equally excited today to make my first Tilda card. These are made by a company called Magnolia. I got three of these from Cheryl Rowley because she duplicated her purchases and sold them to me. (From the look of her gallery, I think she has ALL of them...LOL!) She also gave me some hints about coloring their faces...E00 for the base, E02 for the shading, and R20 for the cheeks (these are copic marker numbers...thanks so much, Cheryl, for the tip). I chose this Tilda stamp because I'm going to visit my Aunt Vi in the nursing home today and I thought I'd take some flowers to her, so this image was perfect! I started with the dp, which is SU's new Parisian Summer! I love that the new catalog gives you the colors it coordinates with, which was bravo burgundy, so saffron, pink pirouette, and sahara sand. I omitted the sahara sand, but used the other colors. I put glitter on her wings, bow, shirt, socks and shoes and the flower centers as well. I kept pretty much to Jesse's layout, except I put the prima flowers in the corner instead of the hodgepodge hardware and ribbon she used. The sentiment on the inside was perfect for Aunt Vi because she has touched so many with her kindness throughout the years. Congratulations to Jesse and I hope you stop by her gallery or blog to get some inspiration of your own! Thanks for stopping by! I just love this Kiwi Kiss with black! This picture does not do this card justice. It's much richer IRL! I need better lighting when I take my pictures! Oh well, on with the the card. This is for Taylor's Cupcake sketch challenge #29. Isn't this a great layout? I couldn't resist making another card tonight because I really liked this layout a lot! And this was so easy to do. I just purchased these epoxy stickers from Michael's the other day in their $1 bin. I love how it looks with the Kiwi Kiss. 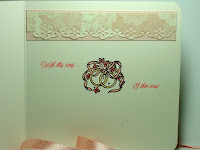 The ribbon is from Michael's too (I think the $1 bin as well) and I've been waiting to use it on just the right card. The dp is SU's Bella Rose, which matches the Kiwi Kiss. You need a square card to do this layout and this one measures 4 3/4" square. I hope you try this one too! Scroll down for another post I did today and TFL! I just got my new SU stamps the other day and I've been excited about making a card with this Grand Soiree stamp. 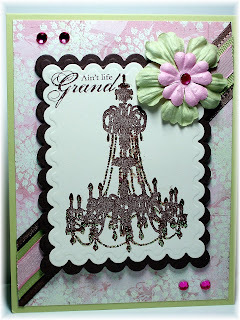 I've seen many of these chandelier stamps and love the look. So I used it for today's Inspiration Challenge. We were given a website for swimsuits and were to choose one as our inspiration. I chose this one. I always gravitate towards the brown colors and I just loved the way this is paired with the pink and green. So I started with PTI's Spring Moss as my base. Then I tried to find a dp that would work. I thought at first I would use SU's Au Chocolat and color in some of the designs with pink and burgundy, but that didn't work, so I found this Basic Grey Sugared dp which had all the colors in it I needed. Then I had trouble with the layout. I decided to use the three ribbons on an angle going across the card. I used SU's chocolate chip satin and pink taffeta ribbons and PTI's spring moss grosgrain ribbon all layered together and liked the look. I tried a few different things for the chandelier as well. I don't have many craft inks, but I did have Versacolor in brown. When I embossed it with clear ep, it looked copper and that didn't work. Then I stamped it in chocolate chip classic ink and quickly poured the ep over it. But it wasn't wet enough for the ep to stick to it, so I just stamped in in the chocolate chip and added crystal stickles to it. I'll have to get more craft inks! I think it would have looked much better embossed! This card did not look *finished* to me when I took the picture and originally posted it. It needed something, so I looked at the sentiment that comes with this set and it looked like it would fit in the corner. I used my stamp-a-ma-jig to place it there. Then I pulled out my prima flowers (I just organized all of them by color and it's so much easier to see what I have!) and found a green and a pink one that matched nicely. I used the same pink crystals from K & Co. that I also placed in the corners. Hope you like it and thanks for stopping by! Don't you just love birdhouses? I do. I'm always looking at them at craft shows, JoAnn's, or anywhere I find them. There is just something about a pretty birdhouse that catches my eye. 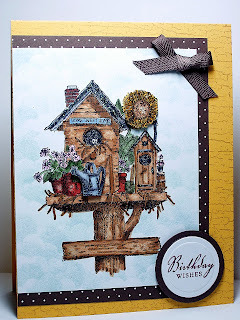 This birdhouse stamp by Impression Obsession was no exception. 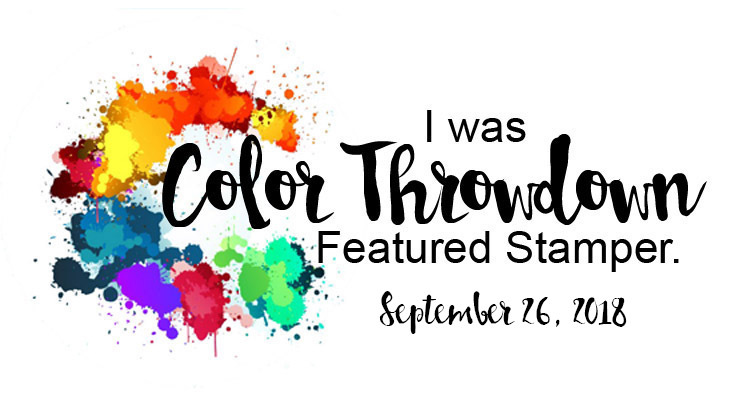 I bought it a while ago at my LSS because I just loved the rustic feel of it and I knew it would be fun to color...and it was! I used copic markers to color it. The sunflower looks really dark because I think I put too many stickles on it. It doesn't look as dark IRL. I popped up the watering can and the sunflower to give it more depth. Once I colored it, I stamped the top part of the birdhouse on a post-it note to create a mask so I could create the clouds in the background. It turns out that I really didn't need the mask because the Soft Sky blue was so light it wouldn't have done anything to my main image. 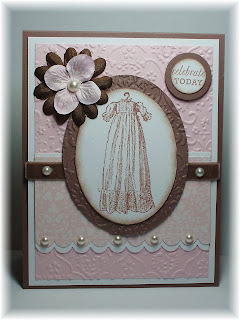 I stamped the Summer Sun base (I don't use this color enough...it's really a rich color) with Weathered bg stamp in Creamy Caramel and mounted the main image on Bella Rose dp. The sentiment is from PTI's Out on a Limb and was cut and layered using Nestabilities. The ribbon is SU's chocolate twill. This layout is from today's sketch challenge at SCS and also for Thursday's Ways to Use it Challenge (use copic markers). Here's the inside. I searched for a watering can...I knew I had to have one somewhere, and lo and behold I found one in MFT's Can Ya Dig It. I also stamped a little flower in the middle of the can because it looked too plain. The Bella Rose dp was punched with SU's scallop border punch. Hope you like it and thanks for stopping by! 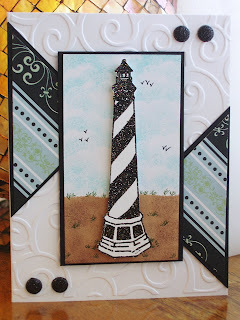 Today's Featured Stamper on SCS is Kim (aka Blondie090277). 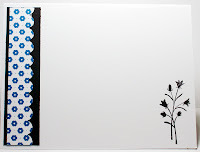 Boy, has she got some nice cards in her gallery and blog! I chose this card to case mostly because of the layout. I've always liked this layout with the circle partially cut off. To start with, I chose this beautiful dp from Graphic 45 that I just got yesterday at my LSS. These colors always speak to me loud and clear! I love the earth tones. I paired So Saffron and Chocolate Chip with it. The stamps are SU's retired Oh, So Lovely. I stamped it in Adirondack black and colored it with copic markers, then stamped the soon-to-be-retired Weathered over it in Creamy Caramel. I tied my bow differently too by using the slot punch. The bottom corners are rounded to sort of tie in with scallops. I used the mat pack to place my brads evenly. When I was putting it all together, I thought the So Saffron base needed to be stamped with the Weathered stamp in Creamy Caramel as well. I kept the card a sympathy card like Kim's because it seems I'm always in need of them in a hurry and I'd like to keep some on hand. Well, that's it...thanks for stopping by! Look what I got today at my LSS, Buffalo Stamps & Stuff...Snowman Riley! Now I wasn't planning on buying any Riley stamps (I've always thought they were cute, but wasn't into them yet). Actually, I wasn't planning on buying ANY stamps, I just wanted some paper and embellishments, but I couldn't resist! Anyway, the owner's husband was in there making a new display, and he started showing me these moose stamps. It turns out that he went to CHA with his wife, Sharon, and he was the one who told her she HAD to buy these stamps! He was so funny showing me the golfing moose and all the others. In fact, he went in the back room to get me this one cause I liked it so much! He was so excited about these stamps...too funny! I also bought a Riley carrying a tree. I stamped four of each tonight and colored them with copic markers while I was watching the Olympics. While I was coloring them, I fell in love! They are very fun to color! 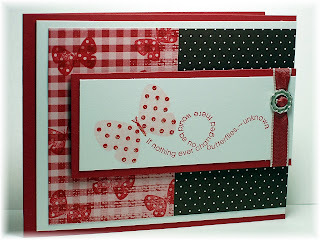 Then, of course, I had to make one card, so I used today's Inspiration Challenge. It was a table done in red, white and blue. The blue is a dead ringer for SU's new Pacific Point In Color, so I paired that with the retired Cerise dp. 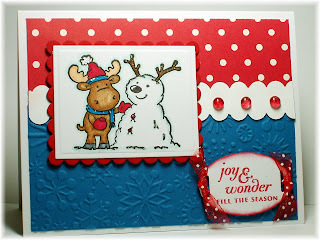 I put the Pacific Point through the Snowflake embossing folder and used SU's new scallop border punch to get the scalloped piece. I punched both sides of the white piece and added dew drops on it. The sentiment is from PTI's Holiday Wishes and I stamped that on a tag I cut with an oval Cuttlebug diecut and tied sheer ribbon on it. I then used a dauber and red ink to give the illusion of a red layer behind the tag. Both the image and sentiment are on dimensionals. Lastly, I added stickles to the main image. This card came together so easily! 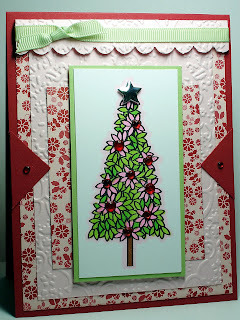 I am so behind on my Christmas card challenge at SCS! I think this will be one I mass produce. Very easy to do! Well, thanks for stopping by! I have another friend who is getting married today and I'm going to the wedding (in just a few short hours and I have so much to do)! I started to make a card hours ago. I was casing a card from PTI's gallery using Wedding Day, but I did not like it from the start, so I had to start all over again with my own design. (That will teach me to copy!) I pulled out this stamp from Stampington & Co. that I got eons ago at my LSS. I've never colored it...I've only embossed this image in silver. Now I'm more comfortable coloring, so that's what I did using copic markers. I used my largest circle Nestability to cut it out and added Crystal stickles to it as well (this qualifies it for the Mothers and Daughters challenge too!). The dp is something I've had for a long time by Liz King. I was going to use it for scrapbooking my wedding album, but that never happened so I'm using it now! 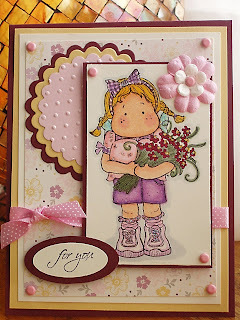 The base of the card is vanilla and the next layer is Blush Blossom. I was going to use a white sheer ribbon, but this peach ribbon was already cut from my first fiasco of a card, so I used that with a little piece of the sheer ribbon. Two of the corners were rounded, and I added the pearls in the corner. Here's the inside of the card. I used more of the dp and a Martha Stewart border punch and layered it on another piece of Blush Blossom. The ring stamp is by Rubber Stampede and the sentiment is from PTI Wedding Day. I'm really happy with this card, considering what I started with! I have another post today, so scoll down to see that and thanks for stopping by! 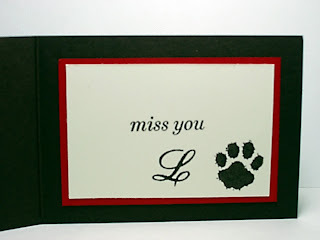 Today's Limited Supplies Challenge was to make an ATC card (mine is 3 1/2" x 2 1/2") that you could put into a loved one's lunch box to let them know you are thinking of them. When I first got married, I used to make my DH's lunch and put post-it notes in there thinking he'd see them when he ate lunch. I later found out that he ate his lunch ON THE WAY TO WORK, so he saw them right after he left me for work! So I stopped doing that (LOL)! Anyway, he worked a really long day yesterday (12 hours), and was so tired when he came home, but he managed to find time to sit and talk with me and also play with our Springer, Lizzie. She was so happy because she missed him all day (and drove me nuts in the process)! The two of them go everywhere together and are "kindred spirits". (Note to self: email GinaK and tell her to make a kindred spirits line of stamps with pets!) 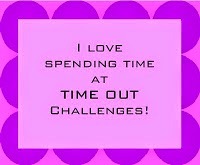 So when I saw this challenge today, I knew immediately that this card was coming from Lizzie! I used this Whipper Snapper dog stamp and colored it with Prismacolor pencils to look sort of like Lizzie (she has a shorter tail and much longer legs). 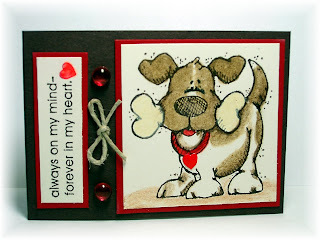 I stamped a heart from Sweet Love (PTI) and cut it out for her collar tag. I just got her a red heart tag the other day, so I had to add that on. I searched for the perfect sentiment, and came up with this one from SU's Always. It is so perfect for Lizzie! I added the twine bow and two dew drops to fill in the space. Her nose, the collar heart tag, and the heart on the sentiment all have crystal effects on them. Here is the inside which I think says it all! I know exactly what my DH is going to say: "You're crazy and you need to go back to work!" Thanks for looking and see you soon! Hello again! I am incorporating two challenges in this card today. 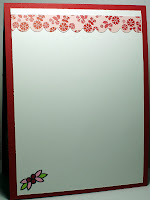 Verve Visual Stamps is celebrating an anni-VERVE-sary and for 12 days they are having sketch challenges (yea!!! ), my favorite! This is the first one (they are already on day 7, and I don't think I'll get to do all of them, but you never know!). I am also combining this with today's Ways to Use It Challenge #178. We were to use jewels in our design. That was very easy with this one. This tree from Believe by PTI was what this sketch needed...something tall and skinny (unlike me, ha-ha)! I colored it with pink and green copic markers and added the red rhinestones. The star on top is something I picked up at a discount store in the scrapbooking section. I layered the tree on Certainly Celery. The Pink Pirouette was run through my cuttlebug and I used SU's scallop border punch for the top piece. I put Certainly Celery ribbon around that piece. The dp is SU's new Bella Rose. It looked holiday-ish to me. The base and triangles are Riding Hood Red. Pretty simple, but these layers drove me crazy! Here's the inside. This would be too much to do for a bunch of cards, but I think it's kind pretty for someone special. Thanks for stopping by! Hi everyone! Sorry I haven't posted in a while...there were a lot of things going on! First of all, I was on vacation last week at our cabin. We had a very nice time with our friends. I have some pictures to share with you at the end of this post if you care to peek. Second, my nephew, Kristoff, who just had his first birthday (see this post), had to have emergency surgery last Tuesday. He had something in his little belly similar to an appendix, which they said only 2% of the population has, and it contained acid such as that in the stomache. Well, it ruptured and burned a hole in his large intestine. They took out a 2" section of the intestine and reconstructed it. They also took out his appendix for good measure. He was in so much pain when I saw him Sunday and Monday. Then I was there this afternoon and he surprised us with a big smile! He is doing so much better, eating, drinking, and laughing and should be released tomorrow! Thank God! So I haven't had much time to stamp, except for the card Kristoff's 4 year old brother, Ethan, my other nephew, made for him with my help. I should have taken a picture of it cause it was so sweet! Farms specifically for this wedding card. I stamped it on white scrap paper in Versamark and embossed it with Starry Night embossing powder...I wanted the *sparkle*. I cut it out and set it aside. Then, using a post-it note, I masked off the top part of white cardstock and brayered the sand with Creamy Caramel and daubed some Chocolate Chip over that for texture. I then took a scalloped circle and using a dauber and Cool Caribbean ink, created the sky. I've played around with this technique before, but this was the first time using it on an actual card. Pretty cool technique and very easy! I then drew in the birds and the grass. The dp is All Dressed Up by DCWV (I love this stack...so many pretty papers and some are glittered, too). 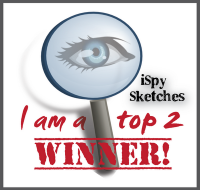 The sketch is from today's Sketch Challenge #188 on SCS. I thought it was so cool. The lighthouse in on dimensionals and the entire main image is on dimensionals as well. I used the Swirls cuttlebug folder and black glitter dots to finish it off. I forgot to take a picture of the inside, but I put a strip of the dp in there as well. Hope you like it...let me know! Thanks for stopping by and take a peek at some of the cabin vacation photos! 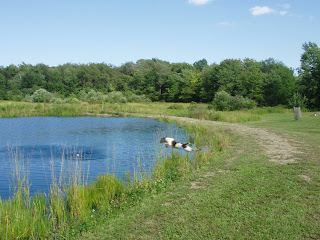 Here are a few photos I took of some of the kids in the pond. 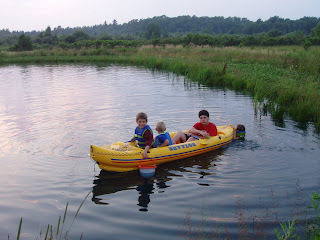 Our friends, Tracy and Alan, have a canoe that they brought and the kids loved it! In the canoe are Kyle, Chase, Brad, and Jacob in the water. 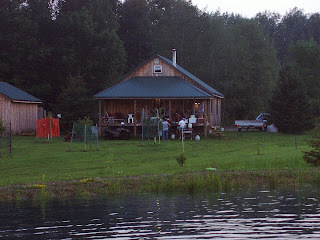 This next one is a picture of our cabin and everyone having a good time (it's a little dark, sorry). This is Zoe, our friends' Bernese Mountain dog. She is the sweetest thing. 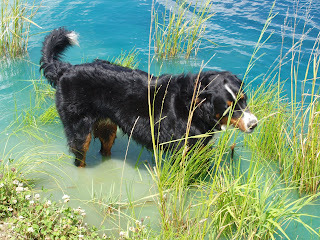 Zoe will only go in the pond up to her knees...she is a mountain dog, after all! 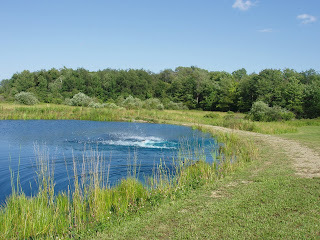 (Our pond is so blue because John, Kevin's best friend and partner in this cabin, put something in it to kill the algae. It looks so cool!) And this is our Lizzie. 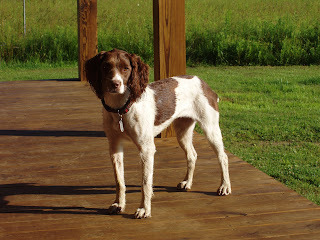 She is a Springer Spaniel, and you'll see in the next picture that she lives up to her name! (She also has her "summer haircut"...she usually has longer fur.) 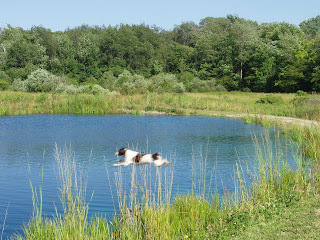 Here she is doing a running jump into the water after a softball that someone hit into the pond for her! She's crazy, I tell ya! I've never seen a dog love playing fetch as much as Lizzie! Here's another jump (look how high she jumps, it's hysterical). And finally the big *splash*! Thanks for letting me share my vacation pics! See you soon!